So the pool has officially been turned over to us. I will get on the computer and update my signature with equipment but first I need reassurance that I am doing the right thing. My pool is approximately 26200 gallons so it looks from pool math that I need to add 30 oz of muriatic acid, 54oz of 6% bleach, and a whopping 582 oz of calcium chloride??? 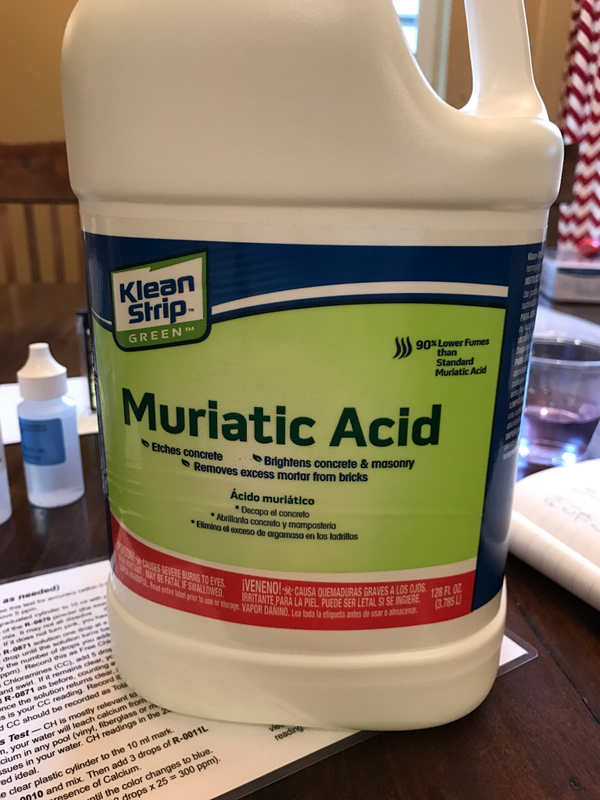 I am attaching my pool math results and I picked up some muriatic acid but now I'm not sure it is the right kind....and where do I get calcium chloride. To say I am overwhelmed would be a huge understanding, haha!! You're not on your own. You have us. I wouldn't worry about CH unless you have to get some kind of documented test results for warranty. It'll climb plenty quick as it cures and through evaporation. You set the target on poolmath. Why'd you go to the high end of recommended? If CYA is really 80, you need to target a higher FC. That "green" acid is not full strength stuff. Of course there's less fumes --- there's less acid! 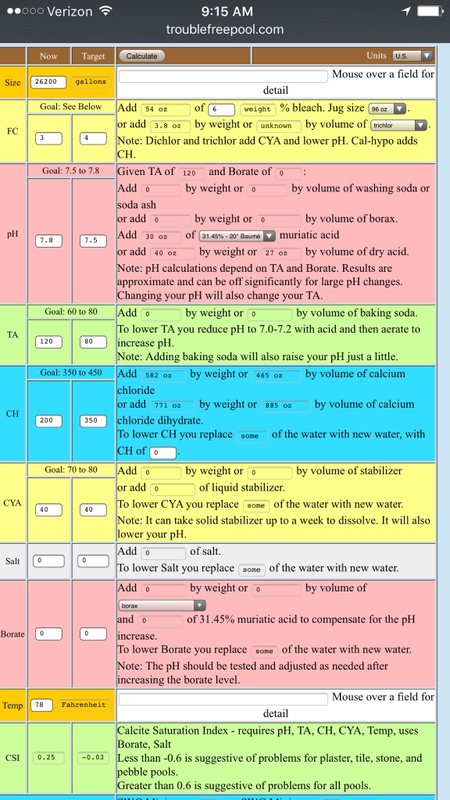 You need to find out the concentration and use the right one to calculate the acid dose. It would be a big help if you'd fill out your signature and also tell us where Hallsville is. I had to look through your post history to see that it's a plaster pool. Later on, when you have more posts, nobody's going to bother. Hi! Welcome to TFP! I'm still new myself, so I'll let the experts chime in to validate your numbers. As a new, first time pool owner myself, I'll just say that this forum has been fantastic for me to learn how to take care of my pool. We've had water in our pool for just over a month now and the water has stayed crystal clear following the recommendations here. One thing I did want to warn you of is that the pic of the muriatic acid you posted is the lower concentration stuff. I got caught off guard by this too, but the stuff that says "low fumes" I believe is half as concentrated as the 31.45% stuff, so adjust accordingly. The full strength stuff should say on the bottle the concentration level. If it doesn't, assume it is half as strong. Where would I find what my FC target needs to be? I intended to use default goals but looking back at it, it appears I messed up on some data entry. I will definitely pay more attention to the acid when I purchase it from now on. Most bleach off the counter today we recommend is 8.25%. You don't mention salt level for SWG. I know where Hallsville is! I can spit and hit it!